For those who remember it, 1992 was a political year. Bush I was up for reelection. Of course, the Democratic contender was Bill Clinton. 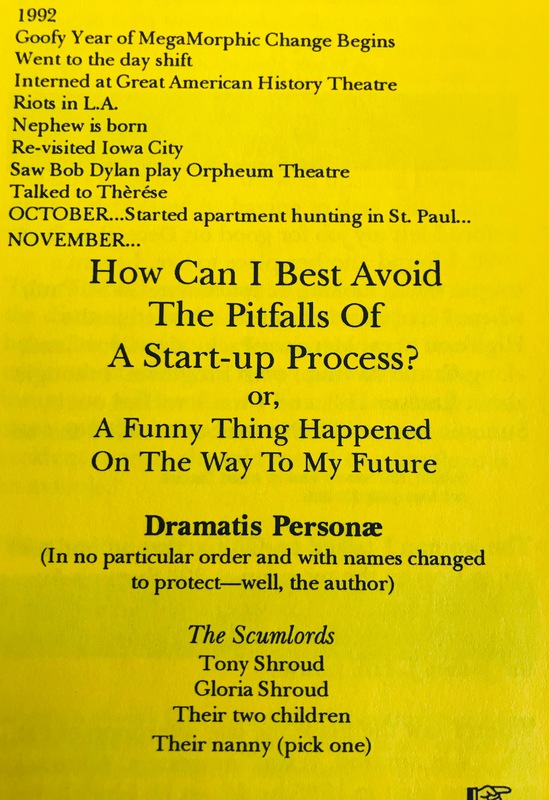 Before I left my job for good on Dec. 7, 1992, I spent a couple weeks looking at apartments in St. Paul, where I had decided to live. I looked in the Highland area, Merriam Park, Mac-Groveland, along Grand Avenue, even Frogtown. I thought about Ramsey Hill, and I was knocked out by Summit Avenue. On November 5, I called this ad: “SUMMIT, help renovate mansion. Immed. Discount rent. Must qualify.” The woman I talked to, G.S., had told me to stop by 295 Summit Avenue, just around the corner from the University Club and up the road from the Cathedral and James J. Hill house. When I saw the place the late afternoon of the 5th, I was amazed. It was impressive. A brick mansion built in 1885 by Albert H. Lindeke. …I had knocked on the front door to no answer, then waited about an hour in my truck for someone to show up. They never did. The next day I set up a time with G. and showed up on the morning of November 6th. The mansion had huge oak doors and a front foyer that opened into a living room with fireplace on the right or left into a locked front office where [the landlords] conducted business. That office was cluttered with boxes, papers, furniture, lamps, posters, so much so that walking around in it was difficult. Through the foyer was a sweeping staircase that led up to the second-floor rooms, past a brass chandelier and gigantic window facing the German Kulturhaus to the southwest. At the top of the stairs on the right was the first room, Andrea’s, follow by Jenny’s room, both of which shared a bathroom with jacuzzi and shower, then the middle bedroom, which became mine; down the hall to the right, Ahmed’s room and across from that, Eric’s room. At the end of the hall was the bathroom shared by us three. They showed me the rooms and mentioned that the room I liked, the large middle bedroom, would be $300 a month, plus a flat utilities charge of $75 a month. All this on a 50-hour-a-month work program. What was this “work program”? They weren’t terribly specific, nor did they seem concerned about who could do what for them. They said I could start by stripping paint off the two doors of my room, the bathroom and the closet doors. Then in the spring they had planned to start on renovating the kitchen, to the back of the house. The kitchen was nearly up-to-speed, paint needed to be stripped, drawers replaced, a wall knocked out, and linoleum pulled up. Yet there was a dishwasher, a washer and dryer, a stove that worked well enough, and two refrigerators for the tenants of the 2nd floor mansion to use. Adjacent to the kitchen was the pantry, stuffed with plaster bags and paint cans, discarded woodwork, jars, tubing, wires, shelving; leading into the dining room into which was packed floor-to-ceiling with mattresses and box springs, bedposts, furniture, mirrors, chest-of-drawers, banquet tables, clothing, tools, equipment, boxes, folding chairs and other junk. Eventually they said they wanted to clean out this room. So, in keeping with that plan for The New Life, I was honest with them about what I wanted. I thought I saw an opportunity to help them put their place in order in exchange for a nice address out of which to run my new business. It felt as far away from the corporate life I knew as I could imagine. It was intoxicating and confusing. I signed the lease for 18 months, thinking it would take at least a year to set up my business and establish clients, and that would also lock-in the reasonable rent. I was set to move November 15. ~ by completelyinthedark on March 15, 2019.